When you’re snowed in, there’s nothing quite like taking a day to shut yourself off from the world. Texts, calls, and emails will be ignored, and work is on hold, meaning nothing can separate you from a day of lounging. The only real question then is how you go about doing a lot of nothing. With your coffee in hand and Netflix at the ready, do you lay in bed, on the couch, or is there something even more glorious out there? The D3CO is a large living room pillow mat that can easily transform itself into whatever piece of living room furniture you desire. 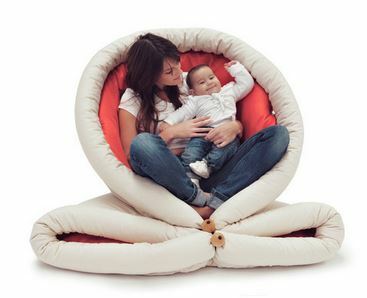 Being comprised of cotton, natural foam, and feathers, this is bound to make your day comfy cozy. 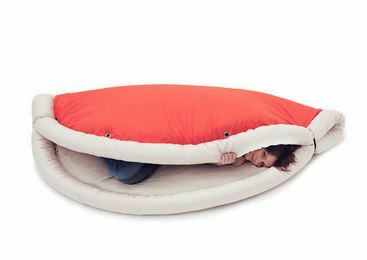 Its ability to change form comes from a combination of wooden balls, hooks, and stretch cord that will allow you to turn it into a rug, armchair, sleeping bag, or bean bag within seconds. This is handmade in Italy and will take 4-6 weeks to show up at your door since these aren’t back-stocked. As you can imagine, something coming from Italy that is handmade with natural components is going to be quite pricey, but the $449 price tag it carries may not seem so steep if you think you would use this enough. You can snag one of these in coral red or electric blue, which makes me wish they also had green, as these greatly resembles Koopa shells.